So we’re half way into the first month of a fresh new year — how’s everyone doing? Did you set new goals, intentions and resolutions for 2017, or are you not really into that whole thing? Each year, I take the beginning of January as an opportunity to reflect on the year prior and evaluate how I can continue to grow and better myself in the upcoming year (if you’ve been with me since last year, you may remember my New Year, New Goals: Planning for a Successful 2016 post). I truly embrace the inherent fresh start that a new year provides and while I make it a priority to check in with myself often, a major overhaul was needed this year! I think the start of a new year is just as good a time as any to reflect, evaluate and set fresh intentions. Today I’m sharing 5 goals and plans I’ve created for myself with then intention of cultivating more balance in my life in 2017 (and beyond! ), plus what I’ve already done to work towards them. I’m also sharing some of my favourite planning, scheduling and creative tools to help me maximize my time, get organized, grow creatively and stay inspired! If you’re still in 2017 planning mode or want to learn more about my goals and plans for 2017 (and there are some big ones! ), pour yourself a cup of coffee and get comfy — let’s get ready to make 2017 our best year yet! UPDATE: Check in on my progress 7 months later! I began last year’s New Year, New Goals post with a quote that resonated with me, so I thought I’d follow suit in this post. 2017 will be all about taking actionable steps to bridge the gap between my current life and my ideal life — sounds lofty, doesn’t it? Well, that’s exactly what I need, because it turns out there are a lot of changes that need to be made in order for me to bridge my gap! This blog is a chronicle of my life (albeit, my highlight reel), passions and creative work — I think it’s important to keep it real and let you know that life as a blogger / creative / entrepreneur isn’t as glamorous as it may seem from the outside looking in. I’m always transparent about the struggles I face as a creative — I even write about them on occasion. Today I’m pulling back the curtain and chatting about the things I need to do to bring more balance and harmony to my world in 2017. Last year, I’m proud to say that I met or exceed the goals I set out for myself. 2016 was an absolutely fantastic year for JustineCelina — I quadrupled my traffic and continued to grow this community, produced work that made me feel more creatively fulfilled than ever, collaborated with talented creatives and established incredible partnerships with some of my favourite brands. Looking back, I’m truly grateful for the success I experienced (and a bit shocked that I was able to make it happen, to be honest!). I planned for a successful 2016, so as a very goal oriented person, I made my vision of success a reality and it was a lot of hard work. However, what I completely lost in the process was a sense of balance in my life. Balance is a tricky thing for anyone, but it’s especially challenging for us ‘A’ types and perfectionists — I truly believe it will be a lifelong struggle of mine. While I’m so fortunate to be able to support myself doing what I love, sometimes the problem is actually that I love it too much. If you know me at all, you know I’m very passionate and an extreme Type A personality. I truly pour my heart and soul into everything I do — JustineCelina is probably the biggest example of that. If I didn’t have to eat or sleep, I would seriously love to work on the blog 24/7, which has definitely ended in consequence in other areas of my life this past year (we’ll talk more about that later!). In 2017 my primary motivation is to figure out my ‘new normal’ between juggling a blog, client work and my personal life — and cultivating a more balanced lifestyle and business though a series of goals and plans. Success looks much different to me now then it did a year ago and I took the beginning of January to reflect, reevaluate and map out what I want to get out of 2017. Here’s how I’m going to integrate more balance into my life this year! Straight up, this one is going to be difficult for me. I have 3 typography based prints that hang in my office. One reads ‘Done is better than perfect’, the next ‘You can do anything but not everything’ and the last ‘Focus on what matters’. They’re laughing at me right now! To give you some background, I’ve been an creativepreneur (and a consultant) for almost 10 years now. I’m used to being ‘on the clock’ for client work since I charge for my services by the hour. As such, I’ve become very good at working through my tasks in an efficient and organized manner when someone is paying for my time. I touched on this in My First Blogiversary + 10 Things I Learned in my First Year of Blogging post, but since I’m my own client at JustineCelina most of the time, I could literally work on a post for forever — I find this to be true even with sponsored work. The blog is different in that I don’t change hourly, even though I do offer different sponsored post packages based on word count, number of images and social coverage that are loosely based on hour involvement, but offered at a flat rate. My twice weekly posting schedule essentially forces me to execute ideas before I get stuck in my own head (this is a very good thing for me, creatively!) but what doesn’t do is limit the amount of hours I spend creating my content. While I love the freedom of being able to create without limitations here, what I’ve learned after almost 2 years of blogging is that I’m much more efficient working on a deadline and an hour cap — even when it comes to blogging. Who would have thought that the structure I initially rebelled against here at JustineCelina would be exactly what I need to get back on track? Oh, the irony. I had a bit of an epiphany at the start of 2017 and have enforced hour caps on posts (to give you an idea, each blog post takes between 10 – 40+ hours to create — which includes planning, conceptualizing, sourcing elements, styling, writing, photographing, editing and promoting). In late 2016, I was working 80+ hour weeks to create my content and run my business — sacrificing sleep, relationships and pretty much everything else in my life. Really, that’s only sustainable for so long. I had to relearn that I only have so many hours in my week available for JustineCelina before it starts to infringe on other areas of my life that I need to make more of a priority again. In 2017, I’ve been able to create content much more efficiently by working under an hour cap for posts and tracking my time like it’s client work. This new structure has been a welcome (and necessary) change, and I find that by treating JustineCelina like a client, I’m able to compartmentalize my work for the blog without it overtaking my entire life, since it really is my job (and an awesome one, at that!). So, done really is better than perfect — especially when 99% of the population would never notice the things I spend countless hours tweaking and obsessing over (I know I’m ridiculous, but I genuinely love the creative process and the details!). I guess I can chalk that up to spending the last 10 years making a living by helping people make things look good — it definitely breeds a very critical, perfectionist eye! It’s a bit of a dichotomy, because I realize the thing that gives my work it’s signature is my creative eye, but it’s also the thing that holds me back from focusing on the bigger picture in many ways. As always, this one is a work in progress for me, but I feel that I now have necessary structures in place to keep it under control. On the surface it may seem like I’m an organized person. And in some areas of my life (like my work and this blog) when I deem organization to be essential, I am. However, in others, I’m extremely disorganized (especially when I’m short on time) and it drives my perfectionist self absolutely insane! I know that better organizational systems are necessary to help maximize my time, schedule myself more efficiently and generally just maintain my sanity (FYI: I lost 2 camera batteries last year and locked myself out of our home and my car on multiple occasions!). So, my organizational overhaul is taking shape in 2 different ways this year. First, I’ve returned to scheduling my editorial calendar for JustineCelina (thank you Epic Blog: One-Year Editorial Planner ) and my client work in quarters. This is something I’ve done intermittently over the years as it’s a must for long term projects, however, I’ve been really strict with myself about scheduling my time this year — both personally and professionally (my new Blush Marble Daily Design Love Planner is so helpful for this — I love the sections for morning, afternoon and evening!). Earlier this month I blocked an afternoon, stat down with a big cup of coffee, my colour coding pens and my various calendars and scheduling tools and completely scheduled Q1. This helps me to get a better idea of what I have on the go and whether or not I’m able to accommodate new accounts and projects, as well as determine where they would best fit. It also allows me to see how my year is shaping up, so that I can also plan for things like travel and vacations (which I haven’t done in 2 years!). The great thing about being your own boss is that you’re absolutely in control of how you spend your time and schedule yourself — and it can also be a disadvantage if you let your business run you. Over the years I’ve been quite successful at scheduling work and balancing my time, but adding the blog into the mix changed everything! I’m happy to report that I’m on the road to figuring out my ‘new normal’ and rejigging things to feel like I’m in control of my time again. Second will be getting our home in order. We’ve been here for almost 5 years and it’s where I live and work — so when I’m working 80 hour weeks, things get crazy around here! When my space is disorganized and chaotic, so is my mind. In 2017 that’s going to change. I’ve started working through our home in sections, purging, cleaning and organizing room by room. I don’t like having things we don’t use and our 1500 square foot, inner city apartment (with no extra storage) doesn’t really allow for us to accumulate a lot of unnecessary items. I really do love cleaning and organizing when I make the time to do it properly — it’s a very cathartic process for me! I plan to be completely finished my home reorganization by mid February and I’m about halfway there. After our space is organized, decluttered and sparkling clean, I’m looking forward to refreshing and completing it, which is another goal of mine this year. More on that one below! I’ve been blogging for almost two years now and I’ve grown so much creatively in that time — believe it or not, when I first started JustineCelina I took all my photos in square format on my iPhone (hey, you’ve gotta start somewhere)! It’s time to invest in my blog and business in meaningful ways that will help me continue to grow and advance my skills. I’ve taken some time to identify exactly what I need in order to do that and in 2017 I’ll be able to turn the tools and upgrades I’ve been dreaming about into a reality. These investments will help me accomplish a number of things that I’ve determined are instrumental in my professional and personal advancement. Here’s what I plan to invest in and upgrade this year! First, I’m finally going to be able to upgrade my camera and photography gear. As a blogger and creative, I use my camera almost daily and I truly feel that I’ve figured out how to use it to it’s fullest potential. Most people are surprised to learn that I shoot all my images on a super basic Canon Rebel with an inexpensive prime lens. I promised myself that I wouldn’t purchase a new camera or lens until I figured out how to stretch the limits of my starter set up, and in 2016 I feel that did that and hit a bit of a wall. I have my sights set on a Canon 5D Mark III and a couple of different lens options, as well as a new tripod (in late 2016 my camera fell off of my tripod mid shoot thanks to a stripped connection, smashing my lens — that was a fun day!). And although I love natural light photography, I know investing in a quality set of studio lights would make my life so much easier! Overall I’m sick of replacing things that aren’t the best quality, working under less than ideal circumstances with inefficient tools and being a slave to daylight. I know that while this is a large investment, it’s one that I’m absolutely ready for! Second, I’m itching to learn Lightroom and establish some new image processing workflows. Currently, I edit photos using a number of methods — years of creative / art direction, styling and design work has afforded me a great skill set. However, I know my current process isn’t as efficient as it could be and with an upgraded camera, lens and editing software I’ll be able to elevate the quality of my work while minimizing my post processing time. Over the past 2 years I’ve discovered that I really love photography — just as much as art direction and styling work. In 2017 I’m working on a number of photography based projects, so I feel that these upgrades are essential to ensure I’m able to provide the best quality I can for my clients and for the blog. Third, I need to invest in tools to help automate mindless things I spend way to much time doing — namely, social media. While social media can be a great tool for bloggers and business owners, they’re also platforms I don’t own (unlike this blog) and therefore cannot control or monetize in any meaningful way. In fact, social media could shut down tomorrow and it would have a minimal impact on my business plan, traffic and the way I generate income for JustineCelina — therefore, my socials have never been my priority. What has been my priority is producing quality content and practicing good, sustainable blog growth practices to increase my traffic. In my mind, that’s a much better way to spend my time than ramping up followers on social media through giveaways and other similar tactics (I can’t think of a more inauthentic way to build a following than by giving away free stuff so people like you or hawking product you don’t even use… but that’s a topic for another time!). At this point, I feel that I need to explore smart, automated options so that I can grow my socials faster and free up time that’s better spent doing other things. While I use and love Planoly to visually plan and schedule my Instagram account (so worth the investment!) Meet Edgar, Crowdfire, Tailwind and Outbrain are also on my list. Fourth, I’m investigating a number of ad networks and additional revenue streams so I can monetize space here at JustineCelina in a more efficient way. Currently, I do work with a number of affiliate programs — and while they’re fantastic, I put them in place almost 2 years ago and feel ready to explore other options since so many new platforms and tools have become available in that timeframe. Mediavine, Ad Sense and LiketoKnow.it are on my radar. This is a more personal goal of mine, but you’ll be seeing it come to life here at JustineCelina in 2017! I mentioned previously that we’ve been in this space for almost 5 years now and it’s time to give things a refresh. It’s a gorgeous space and we love it here, but it needs a few small updates (like a fresh coat of paint!) as well as some upgrades to furniture, decor and unfinished spaces. Realistically, we’ll be here for at least another couple of years and I want to get the space the way I’ve always envisioned it in my mind! Since I live and work here, unfinished, unorganized spaces are always nagging at me — I truly feel that living and working in a space we love will bring more balance and harmony to our lives. With our insane schedules, finishing our home and fully decorating it has fallen by the wayside, so this year I’ve figured out a realistic plan to execute this goal. I’ve divided our home into quarters to work through — first, repainting, entrance and a few small repairs, second the main living area and dining room, third the master suite and last our home office (but maybe not necessarily in that order!). I’m planning to finish a space each quarter and will be partnering with some of my favourite brands and businesses to make it happen. I’m so excited to share our progress with you and bring more home based content to JustineCelina this year! I love metaphors. They’re a visual, conceptual way for me to make sense of things in my head, so please indulge me while I explain the way I’ve been thinking about life lately! I feel like I have all the pieces for the puzzle — that said, some need repair, are misplaced, or scattered all over the apartment! In 2017 I need to figure out a way to put them all together that make sense for me at this stage of life. As a busy person who juggles a lot of roles and tasks (don’t we all?! ), stepping back to take a look at the bigger picture (or the whole puzzle) more often is a major priority for me this year. I feel like 2016 was a nose to the grindstone, accomplish-what’s-right-in-fron-of-you-then-move-onto-the-next-task-in-the-same-manner type of year — it was the hardest I’ve ever worked in my entire life. While that’s a fantastic way to get through a mountain of work quickly, what it doesn’t allow for is any time to step back and mindfully figure out how all the pieces fit together. I have some lofty goals that I’d like to accomplish this year and I know they won’t be possible without a greater awareness of how each piece combines to form a completed puzzle. Working towards the other goals I’ve set out for myself to cultivate a more balanced lifestyle will allow for some much needed breathing room to step back and look at the bigger picture more often. I have 2 ‘big picture’ goals this year — to keep it totally real with you, at this point they seem so far beyond what I feel I have the resources to accomplish. But, I’m going to share them anyway because I think it’s important to put your goals out into the universe, practice visualizing them and begin working towards them! First, I’m going to sync my business up with this blog and market myself and my creative services under one unified brand. Currently, as a creativepreneur I have 2 revenue streams — my business (which I started nearly 10 years ago and still run creative services though) and JustineCelina. Basically, when I started this blog, it was a bit of an experiment in marketing myself and my creative services in a more personal way — it started out as elaborate advertisement to help me market my creative services and attract the type of clients I’d like to work with. Although it is still a marketing tool for client work, it’s evolved past that now into its own thing, which is incredibly rewarding for me. However, also brings about the need to make changes. Fast forward to 2017 and things have really come full circle — my client work, blog work and creative services really are all one in the same. I’m going to rebrand my business and tweak my service offering to allow me to do more of what I love and less of what I don’t, with the ultimate goal of bringing unity, balance and harmony to my creative work. Second, I’m planning an eCommerce component for JustineCelina. This is something I’ve always had the intention of doing, but in 2017 I feel that I’ll be in a good place to make it a reality. I plan to use the hours I’ve freed up usually spent mindlessly obsessing over details, working with inefficient tools or on social media and channel them into developing products. Adding a third, mostly passive revenue stream to my business model will free up even more time for me once it’s off the ground (I’ll be able to generate income by selling products rather than selling my time) and therefore is another important piece of the puzzle in cultivating more balance. So, what exactly will I be offering? To start, I’m going to develop a series of downloadable ebooks and resources piggybacking on a new series I’ll be bringing to the blog this year, The Business of Blogging. No matter the topic, JustineCelina has always been rooted in education and creation, so it feel that it’s a natural step to make additional resources available to answer FAQs about my creative work while providing tips around branding, styling, photography, editing, content development, planning, writing, media kits and pitching, among other topics. I’ll also be developing some gorgeous printed goods (I’ve taken over 80000 photos since starting JustineCelina!) — so you’ll have to stay tuned to see what I have up my sleeve! If you made it to the end of this post, thank you so much for reading! I know it was a long one, but there’s a lot I plan to accomplish in 2017 and organizing my thoughts into a blog post is the best way I’ve found to make myself accountable! Do you make New Years resolutions? What are your goals and plans for 2017? If you’re comfortable sharing them, please leave me a comment — I’d love to know! What are your favourite resources for planning and inspiration? I’m always looking for new notebooks, tools and resources, so I’d appreciate your recommendations. And if there’s any specific content you’d like to see here at JustineCelina this year, please feel free to request it. Wishing each and every one you a balanced 2017 full of health, happiness, success and whatever else you cultivate for yourself! I thought I’d also mention that I am using IFTTT recipes to automate my tweets. You can find a recipe that works with Google Calendar and then visualize what the tweet schedule looks like. You can set it to tweet with an image too. It takes a long time to set up, but so does MeetEdgar. IFTTT is free. You can send me a message if you’d like to know the specific IFTTT recipe I’m using for this. I’d be happy to help because I tried a few and this one works pretty well! So far 2017 has actually been a lot better for me in terms of balance, but I have to work really hard at it. I totally do understand that putting out work that isn’t my definitely of perfect is essential to the creative process, but I do struggle with that still. Like I said, it will always been a work in progress — but at least for now I feel like it’s in check! Thanks for the tech recommendations as well! I’m still doing a bit of research there so they’re incredibly helpful. Have a fantastic weekend! GAH. Ok Justine I have sooooo many things I want to say! Seriously, I feel like this post could be about me and Diversivore (except for the fact that I’m far less stylish). 1. I love what you’re saying about balance. I’ve been spending all of January cleaning stuff up behind the scenes, fixing old photos, reworking some structural stuff – all things that I feel are important, thought my obsessive perfectionism about it all has left me feeling a little frustrated because I have no time to spend on anything new and exciting. I need to remember the Law of Diminishing Returns – at a certain point, you’re putting in a ton of effort for a minimal payout. 2. I couldn’t agree more about organization. I bought the same blogging planner after you and Dana from Killing Thyme raved about it. I haven’t had a lot of time to work with it yet (because of the aforementioned Great January Cleanup) but I’m really excited to work with it. I’m not a natural planner, but I really enjoy having a good and functional schedule. I love it in fact. So fingers crossed for this year. 3. I’m SO interested in cutting down on my time spent (or wasted) on social media. The price tag for all this automation is a bit blah, but I think it’s clear that anything that buys us more usable creative time is paying for itself and then some. I’ve been looking at many of the same options you have (I hadn’t heard about Planoly, but I’m looking into it now! ), and I’m also looking at CoSchedule (and it’s subfeature ReQueue). If you’re seriously looking at Meet Edgar, you might want to compare the two. I’m not promoting one over the other because I haven’t finished researching, but CoSchedule seems to have a lot going for it, and ReQueue does basically the same thing as Meet Edgar, but with more analytics. In any case let me know what you go with, because I’d love to compare notes and figure this stuff out together. 4. Once again, I hear you when it comes to refreshing the personal space. We have some art to hang, and I have multiple construction and decorating projects to finish around the house. Maybe once I buy myself some times (quite literally) I’ll feel like I can take a few weekends to really improve my space too. Or I’ll just spend that time cleaning up toys and cheerios. Ahh, kids. Thanks so much for posting this. Honestly, it was nice to see so many creative, coordinating, and introspective thoughts laid out on the screen (especially given the fact that they felt like they could have been my own). It’s also wonderful knowing that other bloggers (other AWESOME bloggers no less) are feeling and experiencing many of the same things that you are. Hey Sean — again, apologies for the delay in getting back to you! I think it’s SO important to keep it real and share the full picture with my readers (some of which are fellow bloggers, like yourself). Authenticity and integrity are something I truly pride myself on, so it doesn’t feel right to only share the successes on these pages. Thank YOU for being so real and sharing some of your thoughts, goals and dreams for 2017 — I have absolutely no doubt that you’ll be able to meet or exceed your own goals, both personally and for Diversivore! I hope 2017 has been good to you so far — from what I’ve been reading it sounds like you’ve also embarked on the journey towards more balance. 🙂 Cheers to 2017, indeed! I have a great feeling about it. Thank you for such a sweet comment, Mel! I think a lot of us creative types are so similar in our though processes in regards to creativity and our work. I’m glad you found some things you can relate to here! Home projects will start trickling in come April — so stay tuned! I really wanted to curl up for this one, coffee in hand, and devour it. So here I am, finally! Haha. I am *so* with you on that whole finding balance thing. I remember us discussing the long hours of working and how it could take such a toll on us and, this year, rather than chalking it up as being okay because we all do it, I want to get into a better routine that allows me to be more proactive and focused during the day so that by 6 pm, the work day is done. Now, this won’t always happen – mostly because I also really love diving into some aspects of my work like photo, and now video, editing. But I can’t allow myself to burn the candle at both ends anymore. My goal is to be up at 7 am and be in bed by 10 pm. I’ve been sticking to it so far, but there are some other things I need to resolve that I’ll probably be writing a post about soon. But yeah – as always, I respect and admire your transparency. You admit that this blog is a highlight reel, and that’s important because so many people ogle at blogs and then compare themselves and their “behind the scenes” to your highlight reel and end up feeling pretty bad. It’s so important to be honest, and this is one of the many reasons why you’re awesome. I’m so proud of you and the year you’ve had, too! I can’t wait to see what unfolds for you this year. Oh, and your typography prints? I need those. Ha. In fact, so much of this post resonates me. I don’t want to sit here and get into it all because then I’ll just be talking about myself. But gosh, it sure is neat to see that your peers are going through the same growing pains. 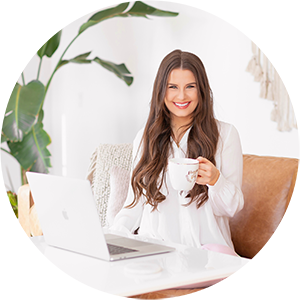 Getting organized is also a big one for me, and the Epic Blog planner has already proven to be a fab tool. I honestly got everything done that I had planned. I love that the layout lets me look at the entire month; my last one was laid out by week, and it had all these unnecessary time slots. It was a headache and I never felt like I was getting things done. The Epic Blog is a winner. My plans. Well. I finally have a pitch/proposal template and I finally just used it and I *finally* have partnered with a brand for sponsored work. I’m also in talks with three other companies right now, so I’m hoping that things can get going with them as well. I feel like this could be the year I really break ground for Killing Thyme. Also, video. I said I’d never do it, but guess what… *kicks ground shyly*. You gotta give the people what they want. Haha. It’s actually really fun, I’ll give it that. And here I am, a month and a half later, curled up with my Saturday morning coffee, responding! Haha. First, thank you so much for the thoughtful comment, Dana. One of my favourite things about blogging is being able to connect with likeminded people all over the world — and our friendship is something I truly cherish. It’s so important to have a good support system in place as we embark on this crazy journey and no one understands the life of a blogger better than fellow bloggers. I’m so glad this post resonated with you and that the Epic Blog Planner is working out for you! Have a great weekend, love! I can’t wait to whip up your Beet Green Pesto. I very much enjoyed reading your thoughts on organization and blogging. I know you’ve been accomplishing a lot, and I’ve wondered how you do it all! I especially like the idea of putting a time limit on a blog post. I’ve been spending a lot of time tweaking little things, as I’ve been learning so much. As a beginner blogger, I’ve allowed myself that. However, it’s time to ramp this up! You’re a great inspiration! I’m looking forward to your material on blogging and your home decor (a passion of mine)! Thank you so much for reading, Cathy! I’m thrilled that you found some helpful ideas here.